Today, I’ll list 20+ of the highest paying affiliate programs. You can make up to $7500 per sale. They fit into multiple niches. They are useful and trusted. It’s not much different to make affiliate sales when you make $3 in commissions than making $500 in affiliate commissions. You just need more convincing posts because people think twice before a considerable expense. However, while those affiliate programs pay high commissions, they are not necessarily expensive, high ticket products. I make a series of the best paying affiliate programs you can use to earn money online. I’ll talk about the high paying affiliate programs: those programs that pay $50, $100, and up to $7500 per sale. List of the best affiliate programs and networks for blogger. How to Earn With Pay per click affiliate programs? 20+ Residual Income Affiliate Programs To Promote! Make Money With Print On Demand Affiliate Programs. Best Pay Per Lead Affiliate Programs. Back to our main concern: high commissions affiliate programs. … Affiliate opportunities can amaze you when you promote the right programs to the right audience. Using affiliate marketing programs that pay, you can make over $7500 for a single sale. And it does not involve additional tasks. It is the same effort you need to make $10 per sale. Still no product creation, no customer support, but higher income. If you target blog traffic that converts, you have a steady income source each month. The list has 20+ legit and high paying affiliate programs; reputable companies with affiliate marketing programs. There are among the best affiliate programs. Programs you can trust, you can use, and safely promote to your audience. Sometimes, to make high commissions, customers have to buy expensive products or services. But, it is not always that scenario, fortunately. This list includes affiliate programs in high paying affiliate niche. They worth their price. You don’t have to fool your readers to make a sale. They are proven effective programs. You can quietly promote them to your audience that you care about. To start with the best affiliate programs you can profit from, let’s consider hosting services. You can promote them within any niche where your audience needs a website. They are affordable. Their plans start at $3.95 per month. (Side note, I recommend the GrowBig plan which starts at $5.95 for server-side caching, free backup restore and free site transfer). They are optimized to deliver fast results within secured environment. You’ll get SSD disks, PHP 7, and AI anti-bot software to filter bad traffic. They have highly skilled technicians you can reach within seconds via chat, phone or emails. They answered and resolved my requests very quick. I wrote a detailed review of Siteground hosting you can check out. If you need secured and fast sites, get hosting on Siteground now. It is an awesome hosting service you can vouch for. So, let’s look at it as an affiliate. For 1-5 sales per month get paid $50 per sale. For 6-10 sales per month, get paid $75 per sale. For 11-20 sales per month, get paid $100 per sale. For anything beyond that, contact your account manager for higher share. It is common to get up to $125 per sale. You can recommend Siteground to your audience whatever their needs. They have shared, cloud, and dedicated hosting. There are established with thousands of clients but still fulfill customers’ needs. They host their own affiliate program. 2) WPEngine: It is one of the top affiliate marketing programs to make money. You can make up to $7500 per sale. It offers reliable WordPress Managed Hosting Services. It does not fit anyone. You’ll make money promoting it to business or individuals who care about site security and loading time. Plans start at $29 per month. But affiliate gets paid $200 minimum or 100% first payment which can be up to $7500 if the sale is greater than $200. You earn the highest income as possible. You can start a 30 days trial to get to know WPEngine and start promoting it. If you bring more than 10 sales a month, you get a bonus up to $1500. If you refer an affiliate, get $50 each time he makes a sale. You can apply through ShareASale affiliate network. 3) Kinsta Hosting: Managed WordPress hosting whose plans start at $30 per month. Promoting Kinsta, you’ll earn $50 to $500 per sale paid once + 10% in recurring revenue. The commission depends on the plan purchased by the referral. It is ideal for entreprise and woocommerce hosting. 4) WPX Hosting: WordPress Hosting plans starting at $24.99 per month. It is one of the few managed WordPress hosting where you don’t get a limit on how much visits you can get per month. You get 100 GB, 200 GB or unlimited GB respectively on Business, Professional and Elite plan. As an affiliate, you earn $70 per referral. If you send more than 100 referrals, you can make up to $100 per sale. 5) CloudWays: Refer customers to CloudWays to earn money. Get paid $50 to $150 per sale one-time, based on how much monthly referrals you get; or $30 one time + 7% lifetime residual commissions. You choose the payment structure that works best for you. It is a company where you can get managed cloud hosting services starting at $10/month for 25GB storage and 1TB bandwidth. You get a dedicated environment to run your sites. You can start a 3-day free trial now – no credit card required. 6) Liquid Web: Promote this managed web hosting company and earn up to $900 per sale. Liquid Web sells Managed WordPress hosting, Cloud hosting, VPS and dedicated server services. As an affiliate you promote LiquidWeb, you earn $125 to $900 per sale paid once, + you earn 5% recurring commissions. 7) MaxCDN: Plans start at $9.99 per month for Content Delivery Network services which make your website load faster across the world. A lot of awesome open source tools such as Jquery or Font Awesome are served through MaxCDN. So, it is a CDN trusted by talented developers. Is it a service for your website and your audience? Check it out and recommend it to your network. Affiliate got paid $175 per sale. Their affiliate program is hosted on ImpactRadius. Who does not need SEO tools for his business online? You need one to earn more passive income by digging into what your readers really want. Because SEO tool is so crucial and because there is competition, you can expect to find high paying affiliate programs to promote in that big ticket niche. 9) LongTailPro: This is the investment most online business owner glad they did. It has a lot of features that make finding long tail keyword research easy. You can check out how many backlinks, social signals your competitor have and how difficult it is to beat them. So, you can wisely pick the most profitable keywords for your business. Find high paying keywords for your blog. Spy over your competitors to find their backlinks and SEO strategies. Get SEO suggestions and audit to rank higher on Google. Find high traffic keywords with low competition. Can it help your audience too? As an affiliate, you earn up to $159.6 per active customer per month. Right! It is a high paying residual income affiliate program. That SEO tool helps you spy on your competitors top performing keywords, backlinks and show you keyword ranking difficulty and advertising data. You’ll find profitable keywords you wouldn’t think of a similar page is ranking for. It helps me to improve my articles for potential keywords I can rank for. I can see what my competitors do to rank higher than me, and I can fix that. They have a free limited plan and awesome premium plans. An affiliate makes 40% each month for each of his active referrals for life. It’s $39.98 to up to $156.9 per active customer each month. I love Berush because it’s high paying commissions and residual income for a steady income. It’s better than most high paying affiliate programs with flat commissions. And it`s an awesome tool. That is $39.98 minimum per customer per month. Except the customers lock at $69.99 per month who bring $27.98 minimum. With 10 active referrals, you earn from $399.8 to $1598 per month in residual commissions. Get paid each month via PayPal when you reach $50 in your account balance; get paid via wire transfer if you earn $1000 or more. 11) Ninja Outreach: This online tool help you build high quality backlinks for your blog,. It helps you through the whole process. Find influencers and their contact details, use effective templates to save time and get seen, send automated follow-ups and track performance. Plans start at $59 per month to $599 per month. Now, as an affiliate, you earn 20% recurring per month per customer. So, you can make $11.80 to $119.80 per month for each active customers you refer to Ninja Outreach. the link to join the affiliate program can be located at the footer menu of the website. You can download it for free to get to know it. It works on Mac Os, Microsoft Windows system, and GNU/Linux OS. You need to upgrade only when you want automated tasks and saved research. Among the best affiliate programs, email service providers are reputed to be a monthly source of residual income for affiliates. Do you have some doubt about it? Let the commissions talk. 13) LeadPages: Build landing page and nurture your email list with this awesome tool. Promoting LeadPages, you earn 30% recurring commission per sale. Join affiliate program hosted on ImpactRadius. 14) Mailerlite: This is the email service provider that I use. Start building your email list for free till you get 1000 subscribers. Get landing pages, automation (email series), rss-to-email. Once you reach 1000 subscribers, pay starting at $10 per month. Way cheaper than alternatives but still the awesome services that you need. An affiliate earn 30% in residual commission per sale for pro subscribers. 15) ConvertKit: Earn 30% recurring affiliate income. The commission goes up to $600 per month. This is a new and yet stellar email service provider. They don’t have a trial program. send email courses on autopilot based on readers intent when clicking your links. More and more online entrepreneurs are moving from Aweber to ConverKit. Is it the email marketing solution for you and your audience? 16) GetReponse: Get paid 33% recurring share per active referral each month. Your earning goes up to $46 per month per active customer you referred. This is a tool to create landing pages and handle email list. They allow you to test their service for free for 30 days. 17) Aweber: Before ConvertKit, it would be the email service most bloggers would recommend you. Now, recommendations split into ConvertKit and Aweber. Still, it is the best solution in most cases. In fact, each need deserves a specific solution. For those who want to build one list on a small budget, Aweber may be the perfect email solution. It starts at $19 per month and the first 30 days are free (credit card not required to test). 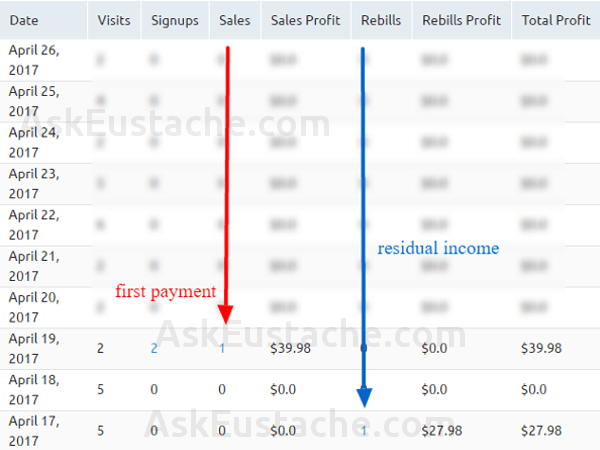 Affiliates get 30% residual commission which goes up to $44 per month per referral. E-commerce field gives the highest paying affiliate programs for you to use. You get high paying commission repeated over months for one sale. The advantage of high ticket affiliate products in e-commerce niche is that your audience is merchants. They are willing to invest; it’s their business. You get the highest affiliate payouts and residual commissions. 18) BigCommerce: BigCommerce is a complete e-commerce solution to sell online. It helps to collect payment, host and secure your online store, convert visitors and sell on social media. 19) Shopify: This e-commerce solution allows you to receive payment at offline stores, to build an online store and even sell on social media like Pinterest, twitter, and Facebook. Their plans start at $9.99 per month. They pay affiliate one time 200% per sale or 20% recurring revenue. It is at affiliates’ choice. They pay affiliates each month via PayPal when your account balance reaches $20. 20) Volusion: Another great shopping cart to sell your products online. It has everything you need to start selling online. Starting from hosting, marketing tools to getting paid. The affiliate program is hosted on ImpactRadius. 21) 3D Cart: Sell online with 3DCart and ease payment process. You can enjoy 15 days free trial. Get to know the program to promote it to your audience. (or to use it if you’re a merchant). It makes it possible to sell in person, accept credit card at POS and build your business. You can also sell online and reach customers regardless where they are located. Pricing Starts at $9.9 per month. no setup fee, no transaction fee. Promote this high ticket affiliate program and earn 300% per sale. This is up to $297 per sale. 22) StudioPress: StudioPress provides SEO optimized theme for WordPress with the Genesis framework. The genesis framework is made to be SEO friendly. Those templates will help you clients buy high-quality designs and make them their own. Promote these WordPress templates and earn 35%, up to $350, per sale. 23) ImProvely: This tool helps you cloak and promote your affiliate link. It is a good tool for affiliates. Improvely helps internet marketers also to track their campaign performance online. they can see hoAdWords AdWords campaigns are doing and take action. It is one of the best online marketing affiliate programs. With one sale, affiliates earn up to $149 + 10% recurring income for the first 12 months. 24) Thesis: Bloggers can easily build WordPress theme with Thesis. It is a drop and drop tool to create awesome pages. It is the direct competitor of StudioPress. When an affiliate involves in making a sale, he gets 33%, which can be up to $120. 25) Affiliate Manager: Like the name suggests, they are affiliate managers who help brand manage their affiliate programs. When you refer a business who hire them, you make $500. It’s a good fit if you own a business to business oriented blog. 26) BigMarker: If your audience needs online marketing tools to grow their email lists and earning, they need a webinar software. Webinars are known to convert participants into customers. BigMarker is a webinar hosting software where blog owners can meet their readers virtually and interact. Affiliates get 50%, up to $199, per sale. 27) ShareASale: This is one of my favorite affiliate networks. I wrote a post listing the 10 reasons I love ShareASale. You can check it out. In addition to these 10 reasons, ShareASale allows to promote their network and make $150 when a merchant join. You make around $1 when a successful publisher join. You reach the end of this top paying affiliate programs list. I suggest to pin it to your Pinterest board to come back each time you want a high commission affiliate program. Share it with your audience if you think they will like it. For more big ticket affiliate programs, check out the best affiliate networks and filter programs from highest commissions to lowest by category. Do high commission affiliate programs really pay? Is it not an action that will reduce their profit? In fact, no. It’s why not every niche is a high paying affiliate niche. The highest paying affiliate programs have high customer retention rate. Even if the merchant pays you $200 per sale, he can easily get that $200 back through awesome services and subscriptions. That’s why the best affiliate programs with high commissions are mostly digital products or services. In addition, affiliates help companies reach out to customers they would never reach otherwise. The marketing efforts from affiliates will boost their trust, search ranking, and native sales. Here is a screen capture for a sale where I got paid more than the sale amount. It is possible that you get paid 100% of the sale revenue as well. So, trust me, they really pay. Therefore, the fact that a company gives you 100% sale revenue or more is a solid proof that it is reliable. The team behind believe in the quality of their services to retain the customer on board. Ok, now, Enjoy that list of high paying affiliate programs that pay, the best affiliate marketing programs for a blogger to use. Bookmark that page to get back anytime you want. Glad you like it, Ted! Thanks for stopping by to leave this comment. I really appreciate! I hope you’ll start seeing an increase in revenue from affiliate marketing very soon. Keep on! We suggested a course in the beginning of the article, check it out. It is a well-made online video course that teaches you how to earn with affiliate marketing the right way. Make sure you sign up for our mailing list, we’ll help you to apply proven strategies to build a solid affiliate marketing business. Thanks, Bill, for stopping by! I really appreciate! Your lists are also awesome! Thanks, Charles, for staying by. ShareASale is my preferred. It tells me exactly where my banner got leads and sales. I do not get problems with tracking, but I use it the simpler way as possible. Hope that list will help you find more high paying programs to make money with. I have built a similar site at http://affiliatewing.com and trying to add as many trusted affiliate programs as possible. One thing I can promise you is that I am going to register on some of these program through your affiliate link as a way of rewarding you for a great job. Please keep it up. Do have a lovely weekend. Thanks for stopping by, Joseph! I am glad to help! I hope you’ll earn higher affiliate commissions with those programs. How did you apply through ShareASale? Did you join the program using the home signup button or though an affiliate program? Your site has enough content to get accepted by ShareASale. Awaiting for your reply, I will check out some auto approve affiliate programs for you within ShareASale. I use shopify too. Ashop is another great e-commerce software. Yes, the list is not exhaustive. I list programs which offer high commission and high quality services. You can point out programs that you trust and I’ll make further investigation. You have an excellent website! I’m no pro but that should not be the issue whatever it is. Your website is far better than many they have probably excepted. If I had to guess, I think I know the reason why they denied you. Chances are you do too? Thank goodness you have many other choices. Thanks for checking my site out. I tried using the signup form on the homepage of ShareASale and have also gone through affiliate links but all to no avail. I am trying my best to keep updating my site and give my readers the best I can. I know they will keep coming back if they are satisfied with my content. Just to find out if you were eventually able to get those auto approve programs for me on ShareASale. I would really appreciate it. Thanks. Have a lovely day. I would like to Thank You Pierre for the awesome list. Thank you for this post. Lots of valuable information. I was particularly happy to get information about the programs that offer recurring payment. Great post. I was asking if you know a back-end high-ticket commissions program to promote without actually buy the products before? Similar to Digital Altitude? I am not familiar with Digital Altitude. I will give it a look. Most of these high paying programs are easy to sell. Pick one or two and target the right audience. I am glad he did it; and I am glad you enjoy the list. I experienced $2000/sale with these programs. It’s all about the right program promoted to the right audience. Eustache, i have really obtain a great knowledge from you. I am happy that the content is valuable to you. Goal reached! I appreciate the time you take to leave your comment, Bango! These high paying affiliate programs can help you make big commissions with your site. I stumbled upon your great, enlightening information. I wanted to thank you and all of the others who contributed here. What I can say, there are programs on JVzoo which pays instantly through PayPal. I just promote Explaindio video maker there. You can check out this affiliate network. It’s a pleasure to help. Pierre,This article help to earn first 200$ as an Affiliates. Thanks! I would like to try Shopify affiliate program, i think there offering satisfies my needs and i would be able to pull it off. Thanks for sharing the list with us. Thanks for stopping by! Glad it helped! Thanks for reading, Michele! I hope you found some help. If you have any further question, feel free to ask them. I am working on my English. I know that I make grammar mistakes and I am trying to improve things. In the meanwhile, I try to be helpful the way I can. I will think about it more than I usually do. I would like to try SiteGround once. Thanks for sharing this awesome list of powerful affiliate programs. I’m new in affiliate marketing and after reading your post I’m kinda motivated. Is it would be good for beginners to start CPA? If any suggestion by you please help me. An informed writing keep up the good work Bro. i would like to try Shopify affiliate program because i have never use this affiliate program. And i also like Digital Ocean affiliate program. Awesome list, Pierre. I usually tend to promote affiliate networks with recurring commission like SEMRush. Thanks for the huge list, I have found some more networks to promote now. You’re welcome, Marius! I promote both recurring and high-ticket affiliate programs. When I find a trusted program with high paying AND recurring commissions, it makes my day. You’ll find such programs in the list too; Specially in web hosting and email marketing categories where good companies retain customers.